Info "In this game, you make a present fall from the sky by popping the balloon that's holding it up." Balloon POP! is the second microgame the player makes in WarioWare: D.I.Y. for the tutorial. The player has to the tap the balloon to make the present fall. Step 1: Objects, animation, and art! The player learns that an object can have 4 sets of art, and each set of art can have 4 cels. Step 2: Making a "floating" balloon! The player is taught how to copy a picture from a different cel to the current cel. Then, the player learns how to slide the copied picture to create a short animation. In this step, the player creates a floating balloon. Step 3: Creating art for a popping balloon! The player learns how to import art to the current cel. 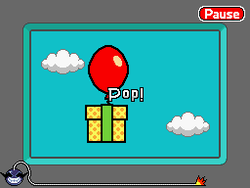 In this step, the player uses the spray eraser tool to partially erase the balloon, and then to create a blank cel to create a popping balloon. Step 4: Having music made for you! The player learns how to use the maestro option to create generated music. Step 5: Moving the balloon! The player learns how to set the starting condition of an object on the stage. In this step the player places the balloon in the stage, sets the starting time to the beginning, and makes the balloon travel a random direction each time. Step 6: Attaching the present! The player learns how to attach an object to another object. In this step the player attaches the present to the balloon. Step 7: Popping the balloon! The player learns how to set the AI of an object to change its art and to add a sound effect, and also to turn on the switch for the win conditions. In this step the player creates a trigger to tap the balloon to change its art to POP!, create a popping sound effect, and to turn on the switch when tapped. In this step the player creates AI for the present to fall when the balloon is tapped.